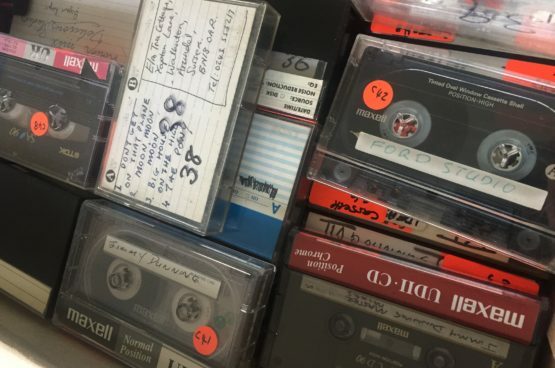 As you know, we discovered a lot of music in Jimmy’s Archive of reel to reel tapes which we have been drawing material from for our last two album releases. There is at least another 3 to 4 albums worth of material we want to release from this but Jimmy also left behind 50 plus cassettes which we decided not to focus on because of the huge amount of time required to go through it all. It took months to transfer and catalogue the 28 reel to reel tapes so 50 or so cassettes seemed daunting. However, earlier this year we had a studio transfer them to digital and Paul has been working his way through the material in search of any gems. This process is now complete and we can report some gems have indeed been found including a song with Jimmy and his brother, Tucker singing. The vast majority of this material is just Jimmy playing guitar and recording ideas but we have found some other studio recordings too. It’s quite possible there is material for another album.